While Flappy Bird did a lot to influence mobile gaming, the game led to plenty of wannabes. But some managed to do a great job at taking after that game's principles and making something better. 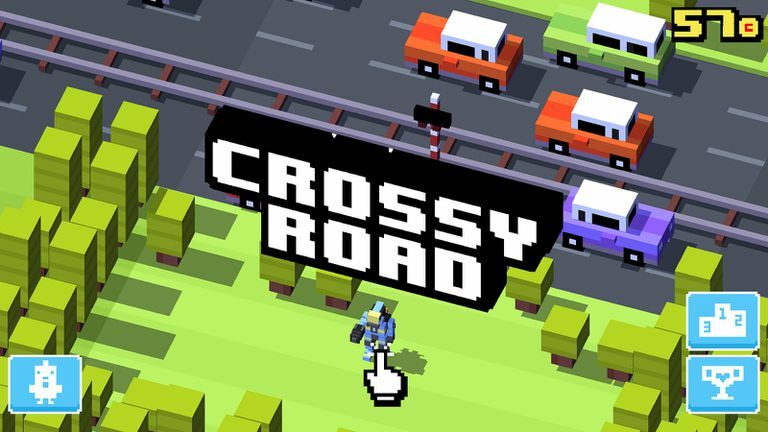 Crossy Road, in particular, was a major influence on future games because it combined simple, familiar Frogger-style gameplay with cute characters and stylish voxel graphics that countless games have since taken after. As well, its character-unlocking business model has done extremely well for the developers at Hipster Whale, but also for other indie developers who have tried to do free-to-play but sometimes failed to do so in the fairway that they want. Many fun games have since risen from the ashes of Crossy Road's impact, and here are some of the best Crossy Road-inspired games on Android. Short, fast paced levels will keep you coming back for more. Captures the classic arcade feel of the original Pac-Man. The difficulty spikes between levels are sometimes drastic. Limited unlockables and power-ups to keep gameplay fresh. Namco partnered up with Hipster Whale to make an endless Pac-Man game in the vein of Crossy Road's Frogger style of play. It works brilliantly; an endlessly-generated Pac-Man maze is great fun, with the different ghost patterns being difficult to deal with. While the characters from Crossy Road aren't really a thing in Pac-Man 256, the powerup system is interesting to play with, giving you a long-term progression. And the themes added in later updates are fun to play with, too. It's a great one-handed game for your commute, and the controller support is fantastic to boot. It's even fun on Android TV. No matter what, it was one of the best games of 2015. It does a better job than Slashy Souls does, which is an odd little crossover game, that some people had a problem with. Charming characters and art style. Diverse level layouts set in highly detailed environments. Some playable goats lack distinctive features. You have to sit through an ad almost every time you die. Zynga of all companies wound up tackling the Crossy Road equation by mixing it with Q-Bert, sort of. You control a goat that can go up and down mountains, trying to ascend as high as possible while collecting coins and dodging the kinds of hazards that a goat has to deal with along the way, such as boulders. The visuals on this game are impressive and will push your device to the limit. Some of the different characters come with their own themes, such as the Tron-inspired VR goat you can unlock, a personal favorite. Original and precise control scheme. Map-based progress and secrets encourage exploration. Only saves your state for a few minutes, so you could lose your progress if you have to take a call. Has a steep difficulty curve. One of the best games of 2015, Land Sliders is a ton of fun. Where Crossy Road's tapping and sliding worked great, sliding the world around with your finger like you would a webpage is a natural addition to a mobile game such as this. And the characters you can unlock are fantastic, particularly since they all come with their own unique collectibles, such as a black hole that swallows planets in each level. It makes sense that the game is a great Crossy Road-like game: the Australian developers at Prettygreat were funded by the makers of Crossy Road! You can skip ads after five seconds. Like very old arcade games, there's no music. This one-tap game is a ton of fun and features a unique scoring system to play with where perfect hits and combos help you get higher points. Plus, you can't sit back and carefully line up your shots as the game quickly ticks down to your doom. It's good pick-up-and-play fun with tons of different themes to unlock, but the game's mission system is a key part of why you'll keep coming back to this one again and again with its very objectives. Epic soundtrack and terrific overall presentation. All extras can be purchased with in-game currency you earn from playing. Default camera angles are sometimes impractical. Navigating the menu and adjusting the settings can be a challenge. Mix Crossy Road with a dungeon crawler feel, and this is what you get. Sure, there's voxel graphics and even a chicken suit to unlock, but variety is the spice of life here. You can unlock several different items and upgrades that can affect how hazards impact you, and even how you move throughout the game. And the levels with special rewards are difficult, fixed challenges that will test you but then reward you. It's a ton of fun and iterates quite well on the Crossy Road formula. Relaxing soundtrack keeps things from getting too frustrating. Nice reward system incentivizes you to not give up. Ads are in annoying places that make it easy to accidentally tap them. Notifications sometimes pop up in the middle of levels. SMG Studio has gotten into making fun and replayable games that can be played with one hand with ease, but One More Dash features some of the best reasons to keep coming back. You have all sorts of customizations to unlock, and the game combines the fast reactions of the aforementioned Boom Dots with a system that is somewhat forgiving for a fast-reaction game, yet still demands great performance. While the swinging gameplay of One More Line is also a great choice, One More Dash is the game we prefer. The dozens of unlockable vehicles are fun to experiment with. Randomly generated maps manage to look unique. Not very different than its follow-up, "Smashy Road: Arena." Touch controls are a little too sensitive. Admittedly, the visuals and interface on this game skew maybe too close to the original Crossy Road. But the gameplay itself is a clever mix of disparate styles, blending in the isometric chases of Pako, with Grand Theft Auto and its wanted system. It makes for a game that's somehow its own unique thing despite having too-obvious influences. It's clear how it became a chart-topping game. Fun and creative boss battles. Every character has their own unique level backdrops. Some items must be repurchased after a set amount of time. Could the shoot 'em up be mixed with Crossy Road? Two of the Crossy Road developers formed a new team and looked to see if they could pull it off. It's colorful, blocky, and a lot of fun, but it ain't easy. Not one bit. Dastardly enemy patterns and only having one life will throw you into a deadly gauntlet, while still having all the fun characters that you expect from a game like this. Upbeat soundtrack keeps players motivated. You sometimes respawn in inconvenient locations after dying. Periodically has trouble syncing with Google Play. Nitrome doesn't do voxels, but they do exceptional pixel art. And their character-unlocking take on endless high score games is a ton of fun. It also features a tricky gameplay mechanic that has you mastering pole vaulting. The timing is tricky to pull off and will require a lot of practice, but it can be really rewarding as you do well at it. Until then, just enjoy the colorful art and fluid animation. Adorable graphics and sound effects. Different shaped balls all handle the same. Ever since the ABA used the red, white, and blue ball, crazy-looking basketballs have become a part of basketball games. This is no exception, as you can start sinking fish bowls like your name was Steph Curry. A slower, one-miss-and-you're-done mode and a faster mode where you score as many points as possible before time runs out provide two disparate experiences in the same game.